Extreme Events in Geospace: Origins, Predictability, and Consequences helps deepen the understanding, description, and forecasting of the complex and inter-related phenomena of extreme space weather events. Composed of chapters written by representatives from many different institutions and fields of space research, the book offers discussions ranging from definitions and historical knowledge to operational issues and methods of analysis. Given that extremes in ionizing radiation, ionospheric irregularities, and geomagnetically induced currents may have the potential to disrupt our technologies or pose danger to human health, it is increasingly important to synthesize the information available on not only those consequences but also the origins and predictability of such events. 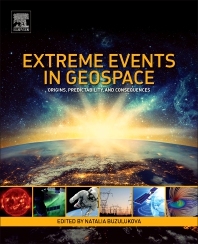 Extreme Events in Geospace: Origins, Predictability, and Consequences is a valuable source for providing the latest research for geophysicists and space weather scientists, as well as industries impacted by space weather events, including GNSS satellites and radio communication, power grids, aviation, and human spaceflight. The list of first/second authors includes M. Hapgood, N. Gopalswamy, K.D. Leka, G. Barnes, Yu. Yermolaev, P. Riley, S. Sharma, G. Lakhina, B. Tsurutani, C. Ngwira, A. Pulkkinen, J. Love, P. Bedrosian, N. Buzulukova, M. Sitnov, W. Denig, M. Panasyuk, R. Hajra, D. Ferguson, S. Lai, L. Narici, K. Tobiska, G. Gapirov, A. Mannucci, T. Fuller-Rowell, X. Yue, G. Crowley, R. Redmon, V. Airapetian, D. Boteler, M. MacAlester, S. Worman, D. Neudegg, and M. Ishii. 19. High Energy Transient Luminous Atmospheric Phenomena: The Potential Danger for Suborbital Flights? 27. Space Weather: What are Policy Makers Seeking? Dr. Natalia Buzulukova is a research scientist in University of Maryland/NASA GSFC, Heliophysics Science Division, Maryland, US. She obtained her PhD from Moscow Space Research Institute working in the field of plasma physics and data analysis. Dr. Buzulukova’s scientific interests cover a broad range of topics, including magnetohydrodynamic modeling of the Earth’s magnetosphere, kinetic Particle-In-Cell simulations of the geomagnetic tail, bounce-averaged models of the Earth’s ring current, modeling of the Earth’s plasmasphere, modeling of energetic neutral atom emissions, modeling of the Earth’s radiation belts, and space weather applications. Dr. Buzulukova is experienced in working with satellite data sets, including past and current NASA missions, and has authored or co-authored more than 20 publications in peer-reviewed journals related to the field.